The UK prime minister plans to impose restrictions on the free movement of citizens from EU member states. David Cameron is making a “historic mistake” by adopting a defensive approach towards the EU which risks increasing the chances of a British exit, the outgoing European commission president José Manuel Barroso will warn on Monday. In the strongest attack by Brussels on the Conservatives over their handling of the EU, Barroso will say that the prime minister’s plan to impose an “arbitrary cap” on immigrants from eastern Europe is contrary to EU law and will alienate Britain’s natural allies. Barroso, the most anglophile commission president of the last 30 years, will give vent to deep frustration at British tactics when he takes the highly unusual step of venturing into internal UK affairs by warning that the Tories should learn from the Scottish referendum and not wait until the final days to make a positive case. In a speech at Chatham House on Monday, Barroso will sweep aside his usual diplomatic language to say: “My experience is that you can never win a debate from the defensive. We saw in Scotland that you actually need to go out and make the positive case. In the same way, if you support continued membership of the EU you need to say what Europe stands for and why it is in the British interest to be part of it. The intervention by Barroso, a month before he stands down after a decade as president of the commission, comes amid deep frustration among EU leaders about the way in which Cameron is hardening his approach to the EU in response to Ukip. Barroso was privately appalled when Philip Hammond, the foreign secretary who is meant to be drumming up support for Britain’s EU reform plans across Europe, told MPs on Friday that Tory plans for an in/out referendum amounted to “lighting a fire” under the EU. The prime minister, who initially instructed his MPs to vote against an in/out referendum before changing his mind in 2012, is embarking on a fresh change of heart as he plans to impose restrictions on the free movement of citizens from EU member states. The prime minister had said the restrictions would be limited to cracking down on benefit tourism. But the Sunday Times reported that Cameron is planning to cap the number of national insurance numbers issued to EU immigrants with low skills. This would hit the 11 eastern European states that have joined since 2004. National insurance numbers could be issued for a limited period to ensure the prime minister delivers on his pledge to reduce net migration to the tens of thousands. 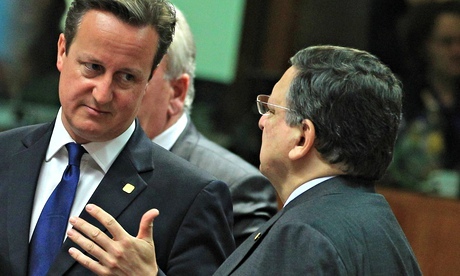 Barroso said that Cameron’s proposal would fall foul of EU law which guarantees the free movement of people. The Lisbon treaty of 2007 echoed the EEC’s founding 1957 treaty of Rome as it said “the free movement of persons is ensured”. The commission president will say that the way in which the Tories have singled out the Poles, whose citizens have travelled to Britain in record numbers over the last decade, is self-defeating. Barroso’s remarks are intended to highlight how Cameron is complicating the only route to achieve his goals – amending the Lisbon treaty which has to be approved by all 28 EU member states. He will draw a second parallel with the Scottish referendum as he reminds his audience that he said that Alex Salmond would have faced an immense challenge in negotiating EU membership.